Last night we kicked off our annual OkTUBAfest here at the University of Iowa with a fantastic recital by our first guest artist, Dr. David Earll from the University of Wisconsin, Platteville. Dr. Earll presented a preview of his very special program of music by Arizona composers which he is about to present throughout Europe next month. The program included: Tapestry II for Solo Tuba and Tape by James Demars, Canticle for Unaccompanied Tuba by “Bear” Thomas C. Woodson, Baroque ‘n Brass and Lyri-Tech by Eugene Anderson, Low End by Glenn Hackbarth, and Relentless Grooves: Armenia by Sam Pilafian. The concert was innovative, musical and inspiring and wish Dr. Earl the best of luck on his tour. 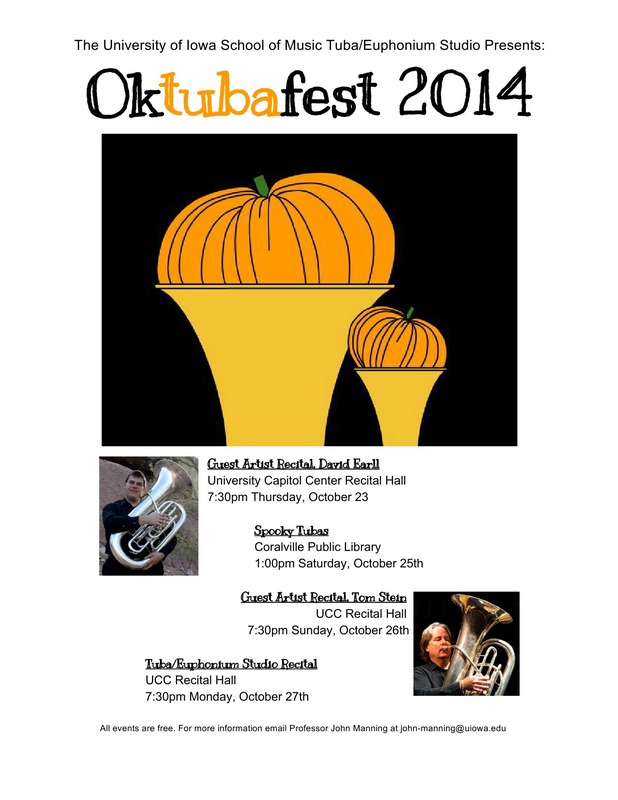 Tomorrow, on Saturday, October 25th, will we present our annual “Spooky Tubas” concert at the Coralville Public Library at 1pm. Collegium Tubum will be presenting a program of polkas prior to librarian Sara Glenn reading “Baby Danced the Polka” by Karen Beaumont. This year, I composed a new work called “Horton Hears a Tuba”, which is incidental music to be performed during a reading of “Horton Hears a Who” by Theodor Seuss Geisel. We really enjoy dressing up in costumes and playing for the children each year. On Sunday night, our second guest artist, Tom Stein from the University of Missouri Kansas City will present a solo recital. The program will be: Arabesque for tuba and euphonium by Joseph Turrin with Randil Jeffreys on euphonium, Sonata (Vox Gabrieli) by Stjepan Sulek, Tuba Concerto by Martin Ellerby, Cascades by Allen Vizzutti, Autumn by John Stevens, and Allegro Fuoco by Roland Szentpali. It promises to be an amazing and impressive program. On Monday night we conclude our OkTUBAfest with a studio recital featuring students performing solos, duos, a quartet and Collegium Tubum. My students have worked very hard this semester and I am very proud of all of them. Please consider joining us for any of these performances and help us celebrate the tenth anniversary of our University of Iowa OkTUBAfest.